Crostini, which means little crusts in Italian, is simply toasted slices of a baguette or other crust bread. This can be done a couple of ways: baked in the oven or placed on a hot griddle or grill to get a smoky taste and aroma. 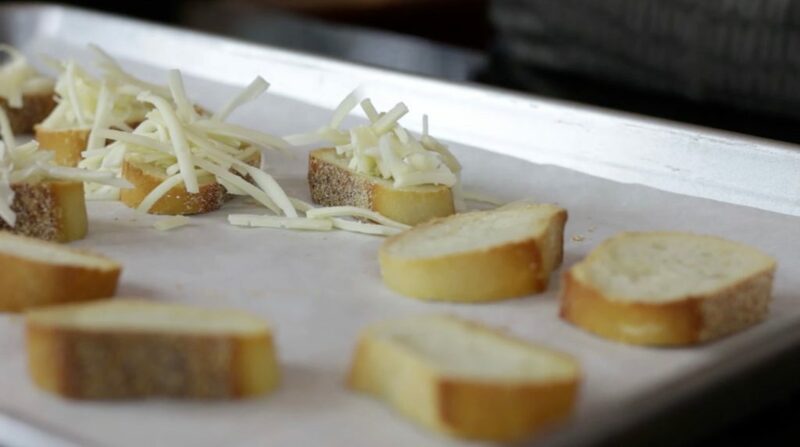 Brushing with a little oil on the surface is optional and not necessary for this recipe since we’re topping our crostini with Gruyere cheese, which we’ll melt in the oven. Use with our French Onion Soup! 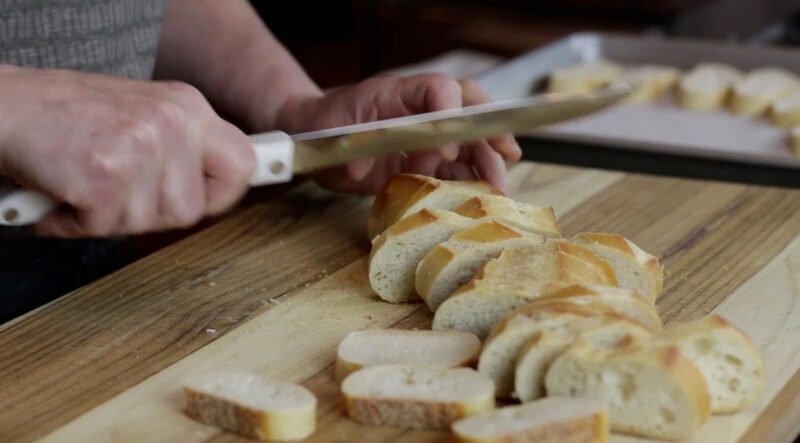 Another way to flavor the crostini is to rub a whole clove of garlic on the toasted bread as soon as it comes out of the oven, the heat of the bread softens the sharpness of the garlic. 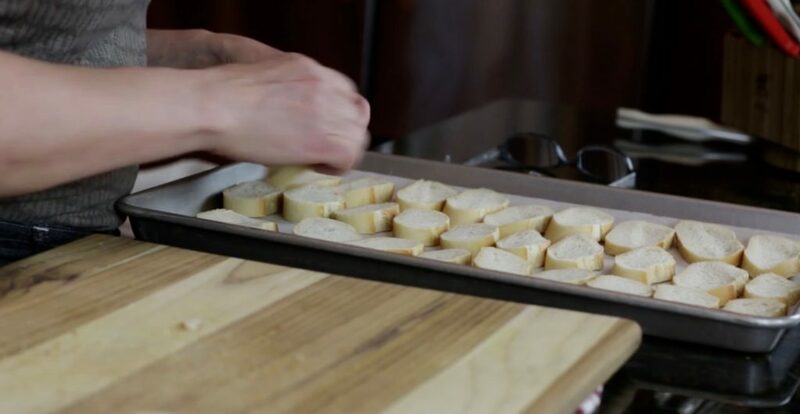 By cutting the crostini on an angle the shape is elongated and takes three to four bites to eat. For a smaller size crostini, cut straight across. Top with sliced cheeses or meats, roasted vegetables or a wide variety of spreads. The possibilities are endless. Crostini go great with cocktails and are easy to prepare. Keep them in an airtight container to prevent them from getting soft. Top just before serving to keep them crispy. Crostini go great with cocktails and are easy to prepare. Keep them in an airtight container to prevent them from getting soft. Top them just before serving to keep them crispy. 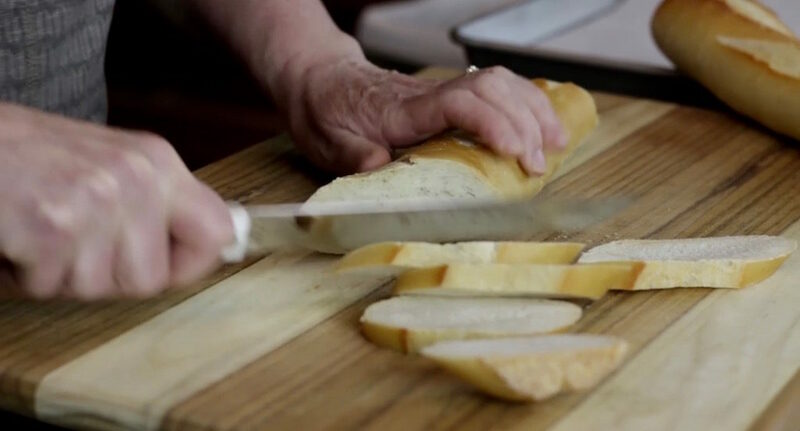 Slice the baguette either on an angle or straight across into slices wide enough to hold a topping and yet thin enough not to overwhelm it. Optional: lightly brush the slices with oil. Place the slices on a parchment lined baking sheet and bake in preheated oven for 12 minutes or until golden brown and crisp. Optional: rub the garlic clove over the top of each crostini.